Last week I made a Black Quinoa Salad with Mango, Avocado, and Tomatoes. Josh absolutely loved the salad. He can’t stop talking about it. He has been bugging me for a week to post the recipe. He said everyone needs this recipe! So hopefully you will enjoy this salad as much as he did:) This healthy salad is easy to make and is great as a main dish or side dish. If you haven’t tried quinoa, what are you waiting for? 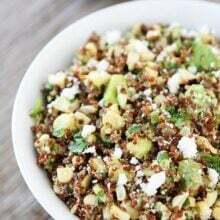 Quinoa is actually a seed that is high in protein and gluten free. It has a slightly nutty flavor and a nice crunchy texture. We used black quinoa for this salad, but any quinoa will do if you can’t find the black variety. (We found black quiona at Whole Foods). I added all of my favorite flavors to this salad: mango, avocado, tomatoes, green onions, and cilantro. I whisked together a simple dressing of fresh lime juice, olive oil, and a hint of cumin and combined everything in a large bowl. I love the contrast of colors in this salad. 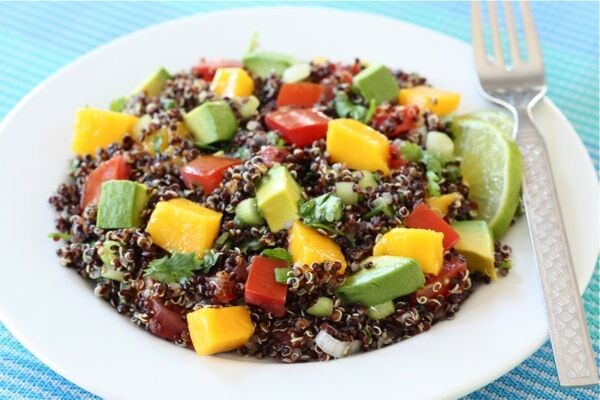 The mango, avocado, and tomatoes really “pop” against the black quinoa. You can serve this salad at room temperature or chilled. We had some salad leftover and enjoyed it the next day and it held up nicely. 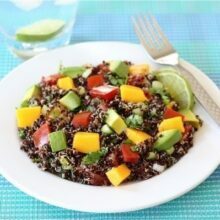 If you are looking for a new salad to try, make this Black Quinoa Salad with Mango, Avocado, and Tomatoes. I love making it for parties because it is vegetarian, gluten free, and vegan. Everyone can enjoy this tasty salad! 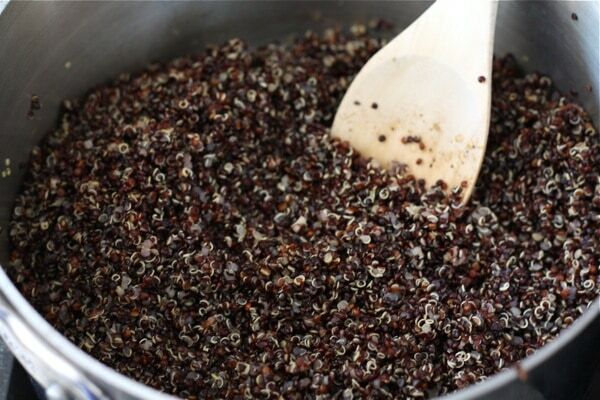 First, using a strainer, rinse the black quinoa under cold water. Add quinoa, water, and salt to a medium saucepan and bring to a boil over medium heat. Boil for 5 minutes. Turn the heat to low and simmer for about 15 minutes, or until water is absorbed. Remove from heat and fluff with a fork. Let cool quinoa cool to room temperature. 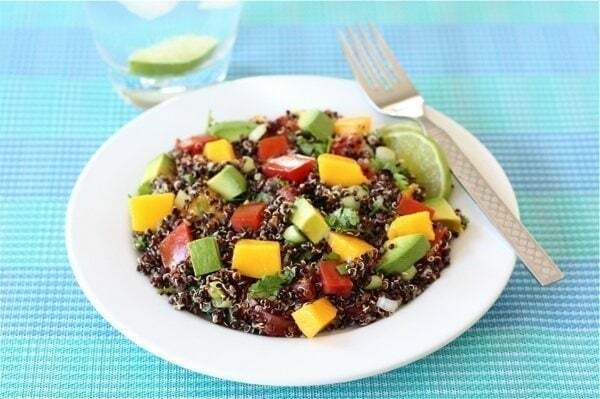 In a large bowl, combine quinoa, mango, tomatoes, green onions, cilantro, and avocados. In a small bowl, whisk together lime juice, olive oil, and cumin. Pour the dressing over the quinoa salad and gently stir until well combined. Season with salt and pepper. Serve at room temperature or chilled. Such a beautiful salad and what a wonderful combination of flavours! We love mangoes:) Thanks Averie! i am ALL about the mangos…i love those things! I don’t think I have ever mixed mango and avocado but it sounds delish! Flagging this recipe for sure!! And I LOVED your corn salad…yum! What do you think of this fun recipe for Meditteranean kabobs…easiest appetizer ever! Oh my goodness, then you must try mango and avocado together in a taco! Over shrimp, perhaps!! The colors of that salad are outstanding – it looks so healthy and fresh!! And so summery!! Holy moly! This looks so good. Thank you for sharing! I will definitely be trying this. Anything that pretty has to taste good! Black quinoa is the best! So yummy & fresh! okay – that looks super refreshing! love the black quinoa! I LOVE this. I’m so in love with black quinoa! I actually just made something similar, including salmon in the salad. I’m going to try your version next. Freaking. Yum. Josh is right…I NEEDED this recipe and am most grateful for it! Avocados are a staple for us, since we grow them on our family farm. Everyone in our family of grown-kids is interested in healthy food and some of us (ahem!) are losing weight. It’s hard to find new recipes that I know from the get-go will be appealing to everyone, including the significant others who are here at mealtime. Can’t wait to try it! That’s almost to pretty to eat!! Love the colors in this salad and it looks so refreshing. I’ll probably use barley since I don’t like quinoa. Love quinoa! This will be good to try. I usually do quinoa, grilled veggies from the garden and balsamic. But this will be something different to try. Excited! These are some of my favorite ingredients, so I know I would love this! A taste of the tropics at lunchtime can never be a bad thing. Wow, this sounds so good and looks so pretty. I’m sure the flavors taste as pretty as this looks. I have a quinoa + mango salad I’m in love with too. Avocados are a great addition! Gorgeous vibrant pics in this post! Isn’t it awesome when the husband LOVES something you put together? This dish is vibrant and I’m sure its also super delicious! I am a big fan of black quinoa! This looks like a wonderful combination and so healthy! 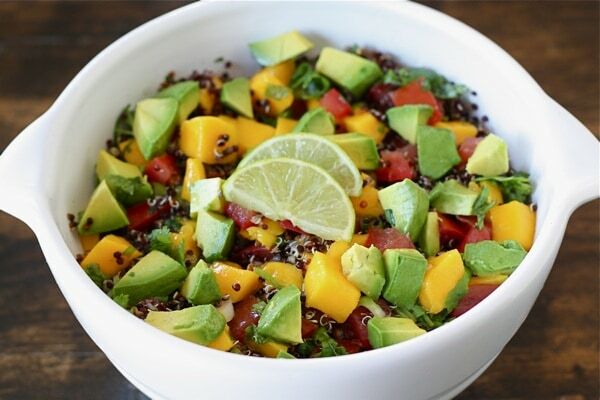 I love black quinoa but with mango, and avocado, I haven’t tried yet. It’s a must for me to prepare this one. Wow, this looks exciting! Cannot wait to make this salad. I was just thinking how I haven’t cooked with quinoa in awhile and the I saw your post appearing. Great refreshing looking salad. pefect for summer. That is such a bowl of goodness Maria! Josh is right, we all needed this recipe! Beautiful and I’m sure delicious too! You can use any variety of quinoa for this salad. Beautiful colors! I need a new summery salad-I’ll have to try it. I like quinoa! What a beautiful, refreshing combination! I loooove avocado and mango, can’t wait till summer here so we can get mango again!! we all love quinoa and this salad sounds like a winner. So colorful. 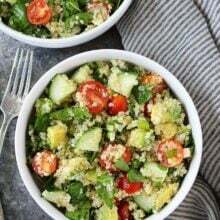 I usually make quinoa salad using the black, red and golden quinoa with ton of veggies. Can’t wait to make your way, love the tropical feeling. Thanks Maria! I was going to pick some black quinoa up today, and I think your dish inspired me to get some tommorrow, looks excellent. I love quinoa salads like the one you made. I made something similar for a luncheon and added some black beans and red bell pepper. Black quinoa is so pretty as a backdrop to bright colored fruits and vegetables. One of my new favourite grains, and not simply for the health and taste of it. It is just GORGEOUS when you add avocado and tomatoes and anything green to it! It just pops right off the plate! We add a bit of buttermilk to our dressing, but I have a thing for creamy dressings…:) Yours is simply gorgeous! It sounds so good! I like the idea of combining fruits and veggies in a salad. I love this flavor combination! Mango and avocado are two of my favs! Great recipe! so funny, my husband goes gaga for black quinoa too! what is it about husbands and black quinoa? hmm.. looks yum!! Mmm I love how light and summery quinoa is! This looks so fresh and delicious! I bet the sweet chunks of mango are so delicious! 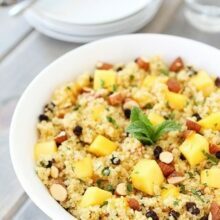 I’ve been looking for a simple recipe using quinoa! I’ve never attempted it, but will give this recipe a shot. Love the sweet and savory idea. Colorful, flavorful, and full of fantastic textures… love it! I can’t wait to make this today! So bright and colorful! This looks gorgeous. Quinoa is one of my favorite things to eat. This was awesome – made it for lunch today. Very easy and tasty! AWESOME recipe!!!! LOVED IT! I didn’t have black quinoa on hand so used the light colored and it still looked and tasted amazing! Will definitely make this again! My Mama lives with me now. I wish she liked quinoa, because I love it. Maybe with this recipe, I can bring her around. I am glad you are convinced:) Let me know what you think! Oh yes! This looks wonderful. Dishes with contrasting flavors really appeal to me, and I’ve noticed that my kids are great eaters bcause they are exposed to a wide variety of food. Adding quinoa to my shopping list! We love this salad! Enjoy! I have made this twice and its always so delicious and worth the time it takes! Thank you! Thanks for sharing this recipe. The combination sounds awesome! I love all of the components in the recipe and feel inspired to make this. Have a good Sunday evening & a great week ahead. Oh Wow! My husband and I are trying to eat less meat. I knew that I could count on you for a recipe that never fails… Cookies, biscuits, anything goes! And this one is no exception! I had all the ingredients just asking to be used for this! And oh WOW! Like eat this with a fork right out of the serving bowl! It is THAT good! I hope he gets home soon… There may not be much left! Thanks again! I just made this salad for lunch this afternoon and everyone loved it – it’s very fresh and perfect on a warm spring day. Thanks! Made this last night with quinoa black bean burgers. Delicious! But next time, I’ll make sure that the avocado and mango are not too ripe. It ended up pretty mushy – although the flavors are great! I can’t wait to try this salad as I love the ingrediants. 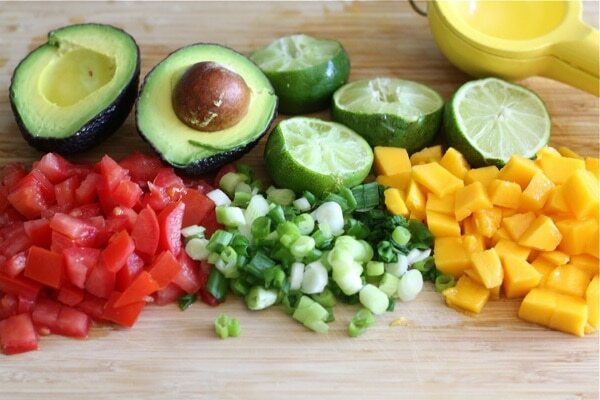 Throw the first 6 ingredients (avocado through corn) into a bowl. Next, whisk together all of the dressing ingredients. Pour over the bowl o’ veggies, stir to combine and you’ve got our favorite salad! Hope you like it as much as we do! This salad would work well for a make ahead recipe as it keeps nicely in the refridgerator for a few days without the avocados going brown. Only 3rd time I had quinoa. This was easy and delicious. Liked it so much I shared w 2 friends within 30 minutes of finishing dinner. Made this for a few friends for lunch yesterday. Fabulous! Worst part is cutting up the mango but well worth it. Glad you enjoyed the quinoa salad! This looks phenomenal! I can’t wait to try. I’ve made this several times now for gatherings and it is always a hit! It’s perfect for a party with lots of toddlers and several friends have asked me for the recipe because they wanted to make it for a party. Thanks!! Love all the colors! Tried this today and added diced chicken. I’d have to do different dressing next time. Healthy and delicious! This looked great, but the dressing – just straight lime juice with one 1 Tbs oil – is too strong! I even added 2 Tbs water and some sugar, but still found it too acidic and tart. Excellent! Made this salad and it was a major hit at my dinner party. I had some leftovers which tasted good, but the fresh is the best! Thanks Maria and Josh for sharing the recipe! I don’t normally comment on blogs. But this salad is outstanding and urge everyone to try. The flavors of creamy avocado, sweetness of the mango, acidity of the tomatoes and the earthiness of the cilantro herb makes a perfectly balanced refreshing side. All family members deemed it a winner. I did add one fresh large minced garlic clove to the vinaigrette with extra Tbsp of evoo. The health benefits of quinoa is a plus. Love the salad! I just made it for a summer party and couldn’t quit eating it. So refreshing. I love the touch of cumin. My sister and I are doing a recipe challenge of sorts, and last week picked quinoa as our main ingredient. Your dish sounded delicious, so I ended up making it (though with a few variations I have to admit) for my boyfriend and me last weekend. He had never had quinoa before, and was a bit timid about it at first. After a few bites he piled a mound of it on his plate, and even brought a big container of it to lunch with him at work the next day. I forced it on his roommates as well, and it was a hit with them too (they had never had quinoa either). Needless to say I will be making this one again; thank you for sharing! 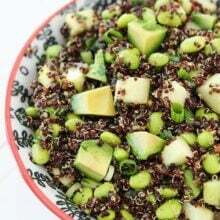 Pingback: Quinoa Salad with Mango and Avocado | Peaches, Please! Just made this. Didn’t have the main grain on hand, so used millet. Also added shrimp. Simple and tasty! LOVED it. Super easy and was so fresh and filling. Grrr wasted an avocado and a mango because I didnt choose well on ripeness. Fortunately I bought several!! Loving this healthy option. Serving it with cedar plank salmon! Made this tonight and it was DELICIOUS! I halved it and didn’t have scallions so i used yellow onion-about 1/2 the quantity. My husband who hates quinoa said, “I guess I’m a convert.”. Served it with tandoori chicken and it was the perfect complement. Thank you for this wonderful recipe. Can’t wait to make it again!